James Trotter loses his parents in a horrible accident and is forced to liveÑmiserablyÑwith his two wicked aunts. Then James is given some magic crystals that give him hope. But when he accidentally spills these crystals on an old peach tree, strange things begin to happen. A peach starts to grow and grow until James is able to climb inside and escape his awful aunts! And through this adventure, he makes some interesting friends, including Grasshopper, Earthworm, Miss Spider, and Centipede, and finally finds a place where he belongs. gruesome. His purpose is not to shock but to entertain, and much of the entertainment comes from the unusual twists in his plots, rather than from grizzly details. 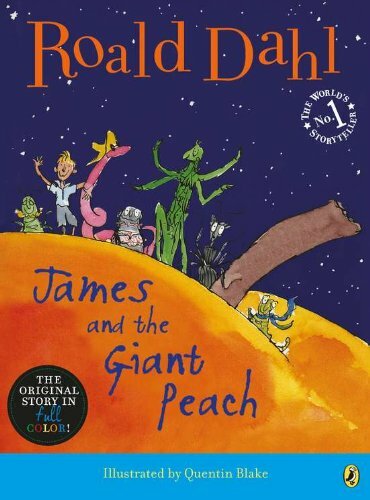 Dahl has also become famous as a writer of children's stories. In some circles, these works have cased great controversy. Critics have charged that Dahl's work is anti-Semitic and degrades women. Nevertheless, his work continues to be read: Charlie and Chocolate Factory (1964) was made into a successful movie, and his books of rhymes for children continue to be very popular. Award-winning illustrator and children's author, Quentin Blake was born in 1932. His first drawings were published in "Punch" when he was 16. He has illustrated almost 300 titles some in collaboration with famous writers such as Russell Hoban, John Yeoman and Roald Dahl. He is the creator of characters such as Mister Magnolia and Mrs. Armitage. His works have earned him numerous awards including the Whitbread Award, the Kate Greenaway Medal, the Emil/Kurt Maschler Award, the Bologna Ragazzi Prize, and in 2002 the Hans Christian Andersen Award for Illustration. In 1999, he was selected as the First Children's Laureate.